And just like that, summer is over. The days are growing shorter; the leaves are changing and local farms are preparing for the harvest. It’s a great time of year to be outside and the season’s fun is just getting started. There are so many activities this fall that celebrate the beauty and bounty of our local lands. 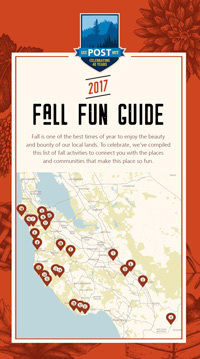 To point you in the right direction, we put together this Fall Fun Guide – a calendar of the best local fall events that celebrate our natural world. Download the guide here to join in the fun. As if that wasn’t enough fun, we are also excited to announce the speakers for this year’s Wallace Stegner Lectures. The theme for our 2018 season is Modern Voices in Conservation and we have an amazing lineup that includes Bill Bryson, Gina McCarthy and Winona LaDuke. We hope you will join us at the Mountain View Center for the Performing Arts for three inspiring, thoughtful and insightful evenings this winter. Season subscriptions are on sale now. Single tickets will go on sale November 30. Photos: San Vicente Creek, Teddy Miller 2016; Fall Fun Guide cover, POST 2017; Wallace Stegner Lecture Series, POST 2017; Backpacker at Long Ridge OSP, Lindsay Dillon 2017; Landscapes Magazine cover, POST 2017; Hiker at Pillar Point, Michael Powers 2015.